One of the most important foods to heal your gut and increase immunity is fermented foods. I am not talking about soy sauce and beer. 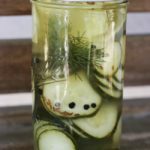 I am talking about probiotic rich foods like sauerkraut, kombucha, miso, kefir, ginger bug sodas and in this recipe…fermented pickles. 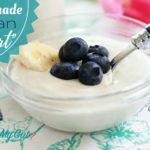 All of fermented foods have a sour flavor to them so getting your kids to eat fermented foods can be tricky. Lucky for you, I have 2 kids that have been guinea pigs to gut healing foods, specifically fermented foods. 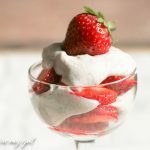 Some things, they spit out, literally, but this recipe in particular, they love! My picky 7-year-old loves fermented pickles so much that she asks me to make them regularly. 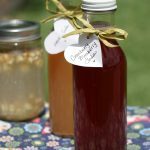 They are simple to make, taking just 10-15 minutes of prep time for three jars. So why do fermented foods increase immunity? It is because 80% of the immune system is housed in the gastro-intestinal tract, also known as the ‘gut’. Your gut is filled with natural flora that helps in digestion and in promoting a healthy immune system. 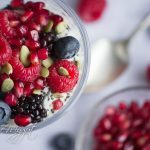 Consuming fermented foods filled with beneficial bacteria on a daily basis such as kefir and sauerkraut is a fundamental key toward keeping your gut flora strong and healthy. Fermented foods are full of little helpers known as “good bugs”. These “good bugs” work hard when they are fermenting. They produce enzymes and lactic acid which aid in digestion. They pre-digest food which allows your body to readily absorb nutrients. They have the capacity to destroy pathogenic bacteria and microbes. They also eat up sugars. I give my kids an extra dose of fermented foods during the holidays to keep their immune system strong. Fermented foods are also a must if you are dealing with candida overgrowth. If you know my story, I battled with candida overgrowth for over 12 years. The first time I had fermented foods was 5 1/2 years ago and was suffering from mastitis due to candida overgrowth. I ate 2 cups of sauerkraut and starting making my own kefir. My mastitis was gone in 1 week and NEVER returned. Hence, this was all thanks to the fermented foods I was eating and those amazing “good bugs”. This is why it is a regular part of my diet and that of my kids. These are a superfood! 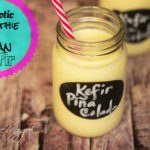 You can prepare fermented cow or goat milk, nut milk, coconut water, pureed coconut meat, pureed nuts, beans, grains, batters, fruits, vegetables and even condiments. Some people even ferment fish, but I have not gone that far. Don’t worry; you can buy many foods already fermented if you’re not up to doing it yourself. I try to get something fermented into my kids diet daily, whether it is kefir, cultured pickles, sauerkraut, or high quality probiotics. Please note that my recipe calls for a culture starter. Many people do not use a culture starter when culturing pickles and that is okay, there is beneficial bacteria in the cabbage leaf. I have tried several different ways and now I ALWAYS add a culture starter. I believe adding the additional six beneficial bacteria’s from the Body Ecology Veggie Culture Starter allows the gut to get a more diverse amount of beneficial bacteria. I have been culturing this way for over 5 years with very good results. 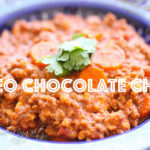 You can find this recipe in my e-book, Essentially Gluten Free: 30 Grain Free Recipes Your Kids Will Love. All recipes are GAPS friendly, nutrient dense and kid approved! To activate culture starter, pour starter into a bowl and add the ½ cup filtered water and honey. Stir and set aside. 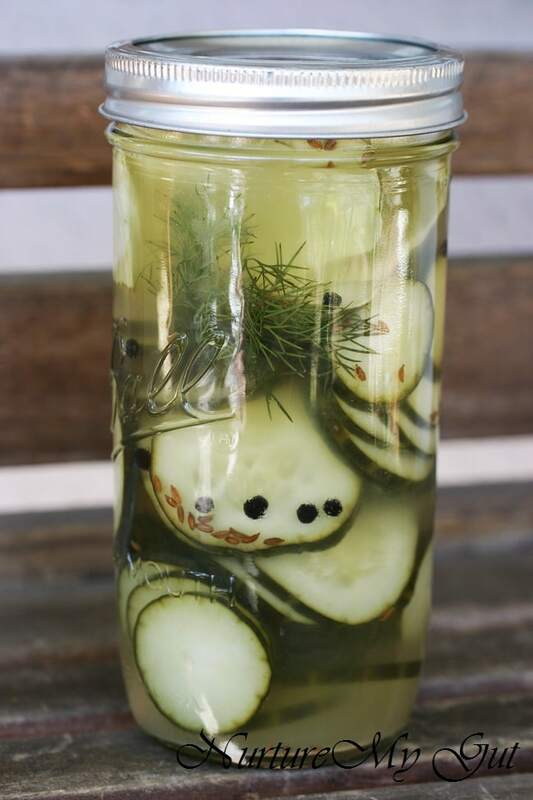 Place sliced cucumber rounds into mason jar, add peppercorns, caraway seeds, and dill. In a large glass, add 1 ½ cups of water and 1 teaspoon of salt, stir well until salt is incorporated. Pour into cucumber jar and stir in the prepared culture starter. 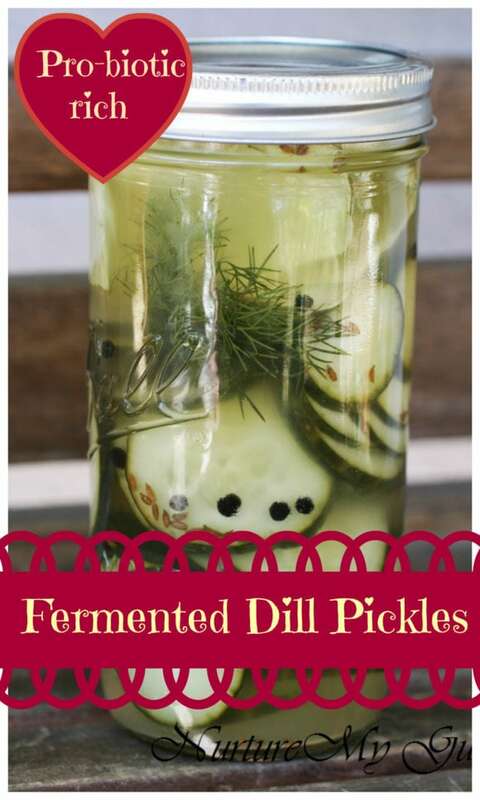 Taste pickles and if they are at the desired flavor, store in the refrigerator for up to 2 months. Bon appetit!